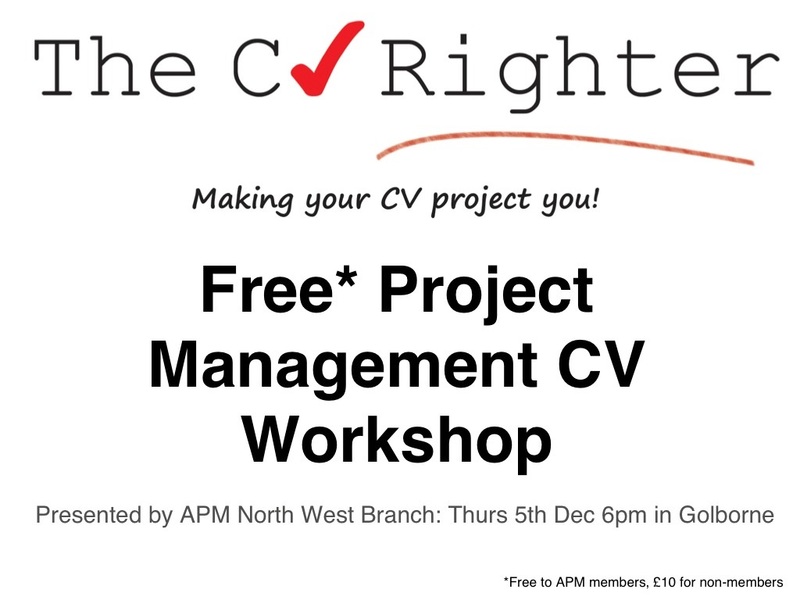 I will be presenting a Free* Project Management CV Workshop at The APM North West Branch on Thursday 5th December at 6pm in Golbourne – this will be an interactive event where I will talk through structuring your CV to make it an effective tool to generate results for your job applications. Recruitment has evolved over the past few years and it has become increasingly difficult to make it into shortlists for interviews, employers expect to see a lot more in a CV than in the past and those who have previously transitioned seamlessly into new roles are now finding job applications a challenge. As the first point of call for job applications is to present your CV, it is imperative that you are making a good impression from the start of the process. An effective project management CV needs to have a balance of information such as project types/size/complexity, how you work (addressing core competencies), key achievements which add value and give a flavour of your management style, and core areas relevant to the type of role you are applying for. I will address all these areas and talk through workable examples to help you grasp what it is that makes an effective CV, I take a recruiter perspective so you can see how it works on the other side of the fence. The session is aimed at all levels of project management – from support roles through to senior level delivery roles. You will gain a greater understanding of what works and how to pitch yourself to hiring managers and walk away with the knowledge of how to create a strong CV which actually yields results in a flooded marketplace. There is also an opportunity for you to have your CV reviewed supplying you with constructive feedback for improvement. Spaces are limited as the session will be very much a “round table” scenario with the opportunity to engage throughout, providing ample opportunity for you to ask questions and have a more personal experience to producing an effective project management CV. More details about the event and to book, visit here. *The session is free for APM members and only £10 for non-members.